It has become pretty clear that here in America, we like people to know when we do something good for the environment. It is arguably why the Toyota Prius has done so well, as it can’t be confused for a gas-only vehicle. 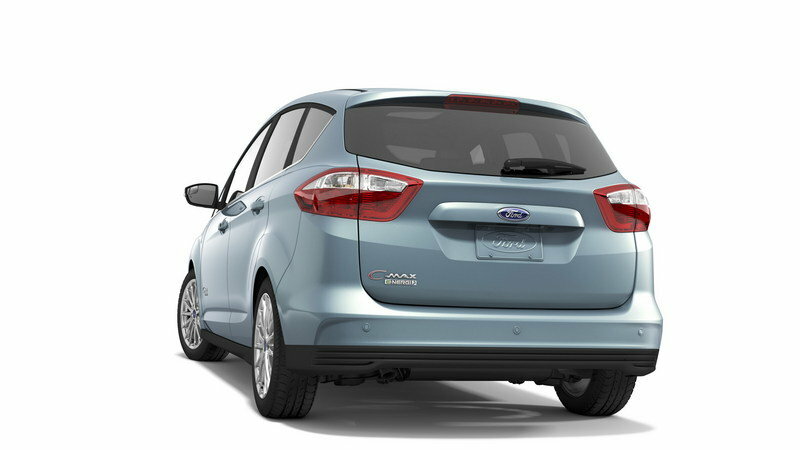 Ford decided to take that to heart here in the U.S., by releasing the hybrid and plug-in C-Max. 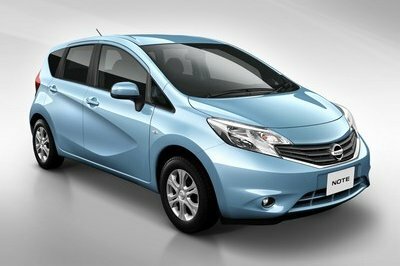 The model itself is available in Europe with gasoline- and diesel-only power plants, but not on this side of the drink. 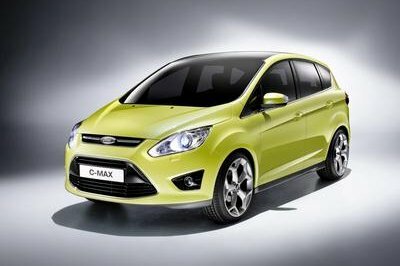 The C-Max has actually be around since 2003 in Europe, but until it got a facelift in 2007, it was known as the Ford Focus C-Max. The name change came when ford decided it wanted to have a “Max” branded line of multi-purpose vehicles. We first saw the Plug-in energy back in 2011 and the North American International Auto Show, and it was finally launched for the 2013 model year as five-seater. Initially there was to be a seven-seater variant here in the U.S., but those plans were eventually canceled before the car’s official launch. The 2016 Ford C-Max Hybrid and C-Max Energi are practically the same in most aspects, but the Energi has a much larger battery pack than its hybrid brethren – allowing it to achieve electric-only operation and higher fuel economy numbers. 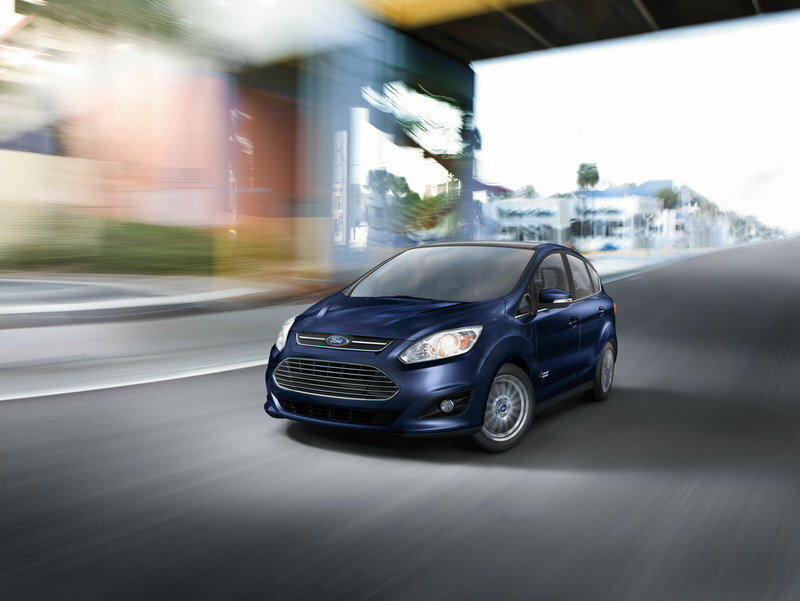 Let’s take a deeper look at the 2016 Ford C-Max Energi. 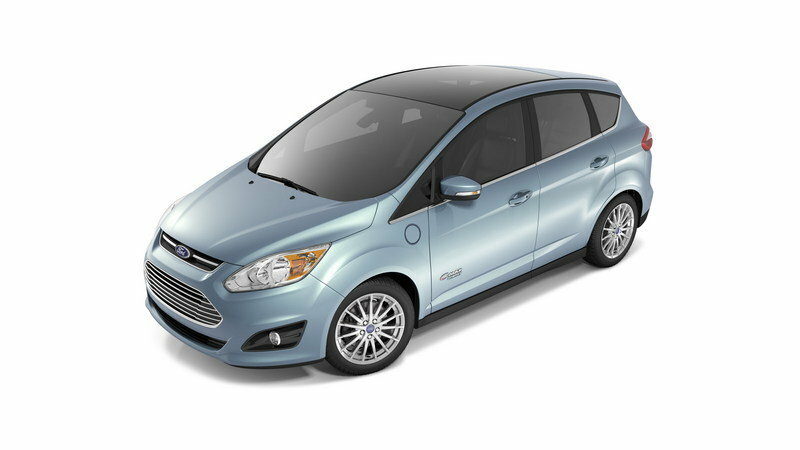 Continue reading to learn more about the Ford C-Max Energi. Here in the U.S., we’re not really used to seeing car’s that carry the design shape of the C-Max. The styling is quite popular in other markets, but Stateside, we just haven’t been a fan of it for one reason or another. It is built on the same architecture of the focus, but is about eight inches taller, which makes it look a little awkward in comparison. This most recent facelift has done the C-Max a lot of justice compared to other models. It finally received the hexagonal grille that other Ford models have, and the headlights have been revised to give them a sleeker, more pointed look. Exterior colors include Kona Blue, Ingot Silver, Tectonic, Magnetic, Oxford White, and Shadow Black. Optional colors include White Platinum for a $595 premium and Ruby Red for a $395 premium. 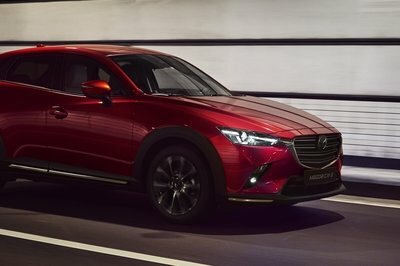 A reverse sensing system, remote start, and 17-inch, 15-spoke alloy wheels are all standard, while options include bumper protection inserts with splash guards, a hands-free powered lift gate, a panoramic fixed glass roof, rear view camera, and charge door graphic. The leather interior can be optioned in either Charcoal Black or Medium Light Stone. Standard features include leather-trimmed seats, Ambient lighting on the door panels and under the dash, Sync 3 infotainment system, Sirius XM radio and heated seats. Optional upgrades include Sony Audio with Sync 3, HD radio and navigation, or a premium Audio and Navigation package that also includes voice activation and Sirius XM travel. All-weather rubber mats can be optioned for $175 extra, and a charge cord bag can be picked up for an extra $65. Essentially, it is safe the say that the interior is already pretty nice before adding any extra options. The ambient lighting offers a comfortable place to sit, and the infotainment system screen sits farther back into the dash, with upward facing buttons in front of it. Heater and other radio controls are somewhat obstructed by the gear shifter, which is positioned farther forward than what you might expect. A dual cup holder and small storage compartment in the center console round out the interior. 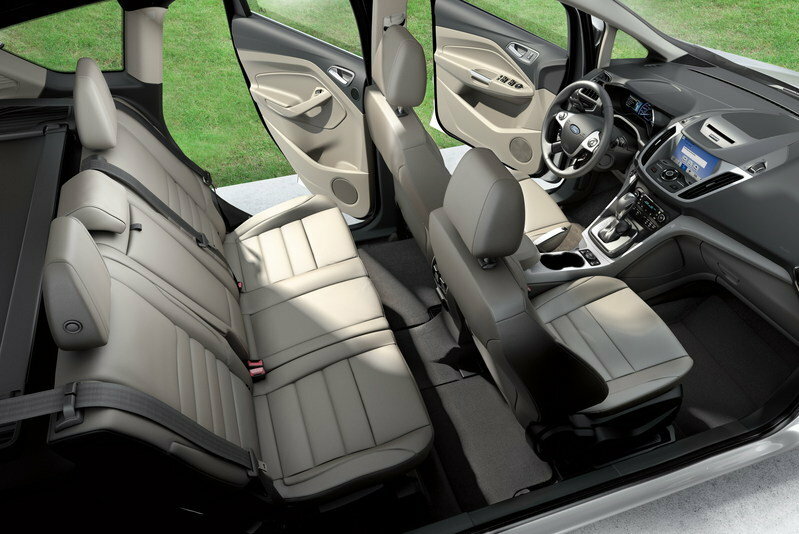 The C-Max Energi is equipped with the same 2.0-liter, Atkinson-Cycle, four-cylinder engine as the standard C-Max Hybrid. It is mated to an electronic CVT transmission and puts out 141 horsepower and 129 pound-feet of torque. In the C-Max, engine only operation brings fuel economy ratings of 40 mpg in the city and 36 mpg on the highway – leading to a combined rating of 38 mpg. You’ll note that these fuel economy numbers are slightly down from the C-Max hybrid, but that is because of the extra weight from the larger battery pack used on the Energi. Both Hybrid and Energi models use a permanent magnet AC synchronous motor, but on the energy, it is powered by a 7.6KWh lithium-ion battery. When running in charge sustain mode the battery has a peak of 35 KW, but in charge depletion mode, the battery is capable of putting out 68 KW. When plugged into a standard 120-volt outlet, it takes about seven hours to fully charge the battery. On a 240-volt plug, it takes just 2.5 hours. 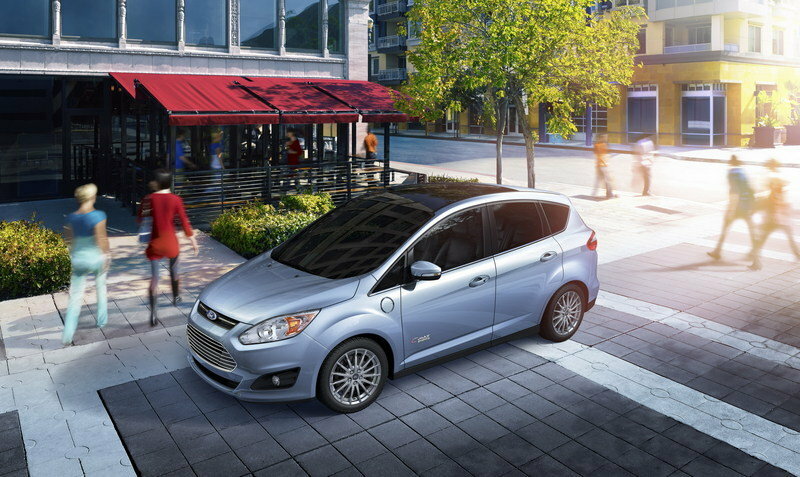 The C-Max Energi has an all-electric range of 19 miles and a top speed of 85 mph. That computes to an EPA estimated equivalent of 95 MPGe in the city and 81 MPGe on the highway. Overall the Energi has a top speed of 102 mph and a combined 188 horsepower in sustain mode or 195 horsepower in charge depletion mode. The Energi comes with front and rear head airbags, dual front side-mounted airbags, emergency braking assist, dusk sensing headlamps, occupant sensing airbag deactivation, stability control, traction control, and a post-collision safety system. When rated by the NHTSA, the Energi received a four-star rating overall. In front barrier crash testing, four-stars were achieved for both the passenger and driver. Side crash ratings came in at five stars (driver, passenger and side pole) for front and rear seats. Roll over protection came in a four stars with a 14.7% risk of rollover. Basically, the Energi is about as safe as most other vehicles out there on the road, so safety shouldn’t be much of a concern. The C-Max starts out at $31,770 before options, registration, and fees. 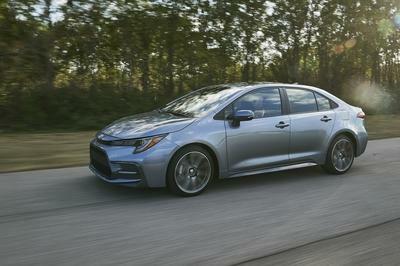 That is a $4,600 premium over the Hybrid SEL trim and a $7,600 premium of the Standard Hybrid SE model. Fully Equipped with all options (including the $595 white-platinum paint) the Energi tops out at $38,565. Total price of options comes to $5,920. 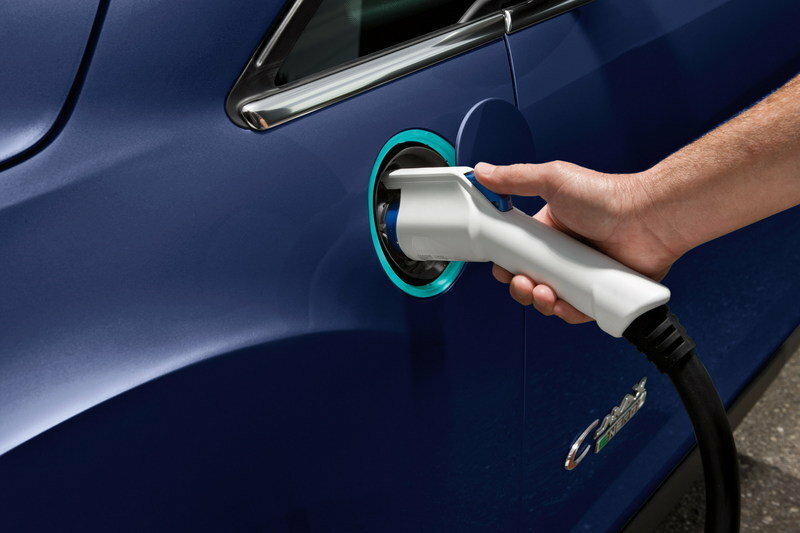 It should be noted that there are also more than $7,000 in incentives offered because of its electric vehicle rating, which brings the prince down to about $500 below the starting MSRP of $31,770. Toyota has yet to release information on the 2016 Plug-in variant of the Prius, but in 2015, it started out at $29,990 and pulled an equivalent of 95 MPGe or 50 mpg combined — I don’t expect any of these numbers to change much when the plug-in model debuts next year. Granted, in EV mode, the Prius was only good for 11 miles, but the improved fuel economy of the gasoline engine made up for the difference in EV range when compared to the Energi. 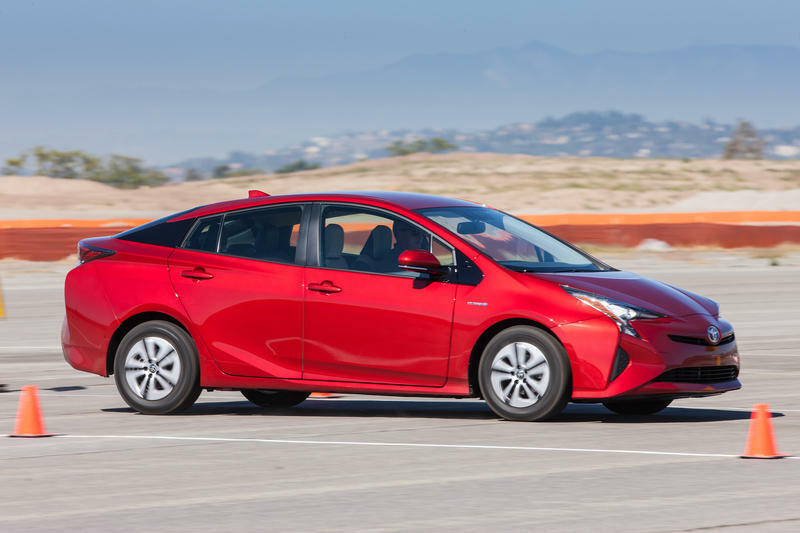 Read more about the 2016 toyota Prius here. Audi spent years developing all kinds of plug-in prototypes, and it finally settled with the A3 E-Tron. The car has a 1.4-liter gasoline engine and an electric motor hooked up to a 9 KWh battery. It has an all-electric range of 30 miles. Pricing starts out at $37,900, which is a bit higher than the Energi, but it is a bit more stylish and has a better all-electric range. 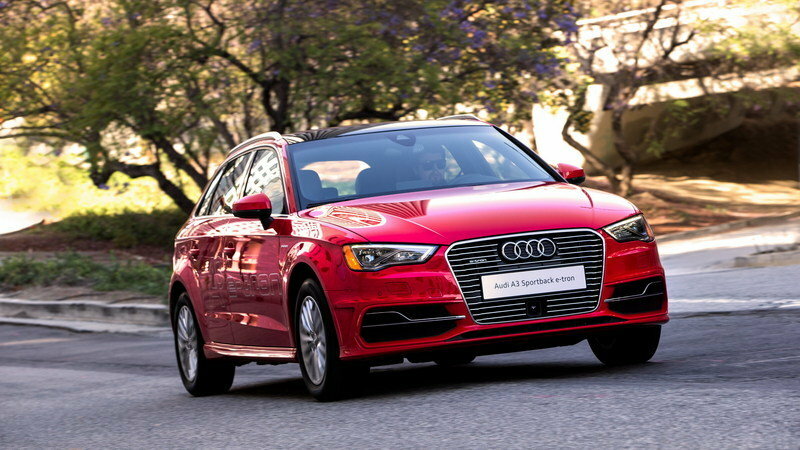 Read more about the 2016 Audi A3 E-Tron here. When I look at the numbers, I don’t quite see how cars like the Energi make much sense, unless you have a really short daily commute. The Energi has an all-electric range of 19 miles, which really isn’t all that much. Even if you run in all-electric mode until the battery is depleted, you’re still saving less than a half-gallon of gasoline. 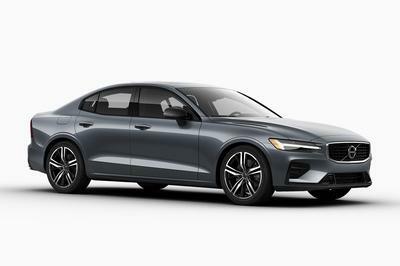 From a financial stand-point that isn’t a lot of savings at current gas prices, considering the $4,500 premium over the Hybrid SEL trim level. At this point, having the plug-in model is more of showing your status to the world as opposed to saving money and the environment. I’ll be impressed when battery technology evolves enough that it is practical to have a battery capable of delivering 100-plus miles of range without sacrificing cargo space or selling price.